For all of its rules, clauses, and exceptions, property and casualty insurance – what you buy for your car or home – is relatively straightforward. You pay an insurance company a monthly fee – a premium – in exchange for their promise to pay you if you suffer a loss, such as a car accident or a house fire. In addition, whether to buy insurance is less of a choice than ever before. Banks and mortgage companies compel homebuyers to take out homeowner’s insurance so that their investment is protected. And nearly every state forces drivers to have car insurance. More than a dozen states call for greater coverage than liability insurance. Did the insurer act unreasonably? Did the insurer know that its actions were unreasonable or did it act with reckless disregard? We have the experience and resources to fight for your rights and help you secure the compensation you deserve. If you have been seriously injured in a car accident, reach out to a Phoenix personal injury lawyer at Burg Simpson Arizona by filling out a Free Case Evaluation form HERE or by calling us at 602-777-7000. What Can You Do If Your Insurance Acted In Bad Faith? Breach of Contract – An insurance agreement is a just another contract where the insured pays premiums in return for the insurance coverage, defense, and the monetary value of the policy payment. Because of that, an insurer’s refusal to hold up their end of the contract may constitute a breach of contract. Tort – An insurer’s act of bad faith can also be classified a tort claim. A tort is a civil wrong where one party harms another party through their actions. If you or a loved one has been hurt by someone’s negligent actions behind the wheel, call a Burg Simpson Phoenix car accident attorney = at 602-777-7000. 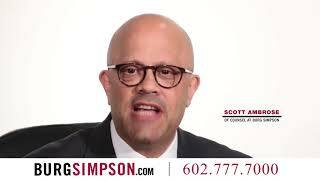 When personal injury is sustained from the carelessness of another, Burg Simpson is here to defend your rights in the state of Arizona. Reach out to our Phoenix office today for a free initial review of your case. Our experienced trial attorneys will evaluate your case and offer legal counsel. 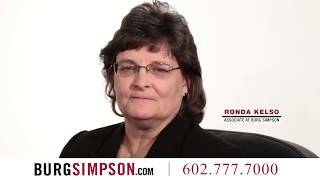 So pick up the phone and call Burg Simpson today at 602-777-7000 so you can talk with a Phoenix car accident lawyer. You can also complete our Free Case Evaluation Form Here.